This is not a popcorn movie. Don’t plan on munching on bits of buttered kernel goodness while watching this graphic doc about the ER at LA County Hospital. Do not fret though, Ryan McGarry, Senior Resident Physician and writer/director of this very film, makes up for the ghastly factor of sutures and massive chest cracking trauma with his dreamy qualities. McGarry and his counterparts walk us through the ins and outs of the busiest ER in the world where more people have lost their lives per square foot than anywhere in the US and where the same can be said as for lives saved. Words cannot describe the chaos that abounds in this birthplace of the modern day Emergency Room . Moving images are needed to illustrate the true nature of the turmoil and lucky for us, Code Black provides just that, as well as a fascinating look at the history of this storied County Hospital. But make no mistake, McGarry and company didn’t set out to simply boast about their heroics. This film is a rallying cry for healthcare reform which becomes explicitly apparent at the halfway mark when the old Gothic facility gets shut down due to earthquake code violations and the new sterile, sleek and spacious building opens up across the street. With this physical move into the modern hospital comes better machines, cleaner work spaces and more room/rooms. Unfortunately, all the suffocating bureaucracy and paperwork of modern medicine have also “come home to roost” as Senior Dr. Billy Mallon puts it. 18 hour wait times have become the norm and doctor/patient interaction has taken a backseat to the mounting forms that must be meticulously filled out for every individual in need. Two minutes of hands on treatment will often be followed up with 25 minutes of monotonous paperwork. That’s for every single patient. 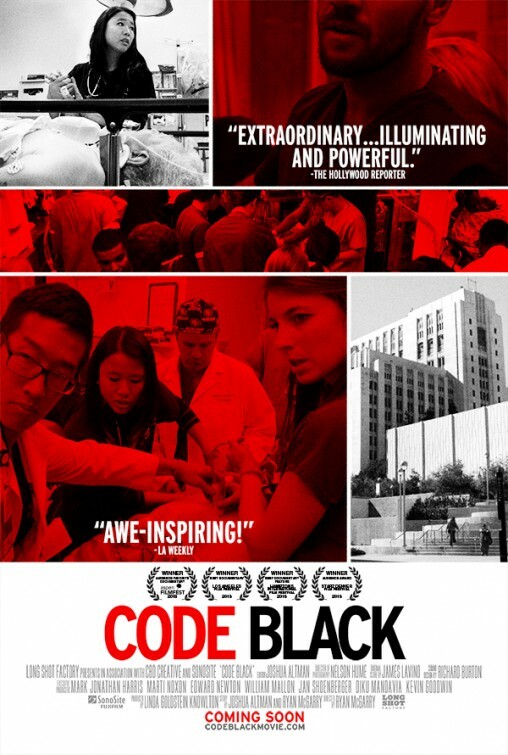 Despite all this, Code Black makes you want to be an ER Doc, the same way cop movies made you want to be a police officer when you were a kid. These people save people for a living and in a world where so many of us have to make ends meet by pushing paper for a cause we don’t believe in, these brave individuals work for something we can all believe in. That is once all the appropriate papers have been pushed. Posted on Wednesday, July 2nd, 2014 at 2:15 pm and is filed under Reviews.